In our previous tutorial, we introduced you to the Scrum Events – Sprint, Sprint Planning, Daily Scrum, Sprint Review & Sprint Retrospection. We discussed the concepts like time boxing, participants, and activities for each of the Scrum Event. The next in store for our readers is Defect Triaging – A concept which isn’t new to the QA folks but we will try to understand the importance of Defect Triaging and how is it organized in a Scrum Setup. So let’s start with understanding ‘What is Defect Triaging?’. Defect Triaging is a formal meeting where all the defects of the current Sprint are discussed and triaged i.e. Prioritized. The QA Developers in the Development Team demonstrates and explains the defects to the rest of the Scrum Team. Based on everyone's input, the defects are then organized and classified into different categories. Some of the important deciding factors for categorizing these Defects could be Severity, Risk associated, Business Impact, Occurrence, Nature etc. Based on these categories, we then decide how soon the defect needs to be resolved. The Defect Triaging meeting is participated by all the Scrum Team Members. There may be a possibility that the Stakeholders (Internal or External) may also be included in the Defect Triaging Meeting. Let us now discuss and establish a clear distinction around the Roles and Responsibilities of each of the Scrum Team Member during the Defect Triaging Meeting. Developers explain and demonstrate the Defect. Developers would also focus on the root cause analysis. Developers would provide an insight on the application areas impacted by the Defect. A combined call is made as to whether the defect is acceptable or should be rejected. Helps in Prioritization of the Defect. Expresses the complexity involved in fixing the Defect. Assign the Defects amongst themselves for Fixing and Retesting. Scrum Master is also responsible for organizing the Defect Triaging Meeting. Scrum Master may also facilitate the meeting if asked by the rest of the team members. Take notes if there are any impediments that the team may encounter for the Defect Fixes. Checks that the meeting is time-boxed and does not deviate from the focus. Classifies the Defects to particular Defect Classes by assigning their Priority and Severity. Along with the team, the Scrum Master also brings the improvement areas on the table. Has a major stake in Prioritization of the Defects that would determine how latest the defect can be resolved. For the defects, having a medium priority, the Product Owner can plan to place them in the Product Backlog to be picked up for the subsequent releases. Allows the team to understand how the business would be impacted because of the Defect. Product Owner takes on the end user’s perspective and sentiments while discussing the defects. All the Scrum Team Members get together in a meeting room for a Defect Triaging Meeting. Anyone from the Developer's Team can take a lead and start discussing the Defects in detail. The team then discusses each of the defects for its validity. The defect is rejected if it is found to be invalid. 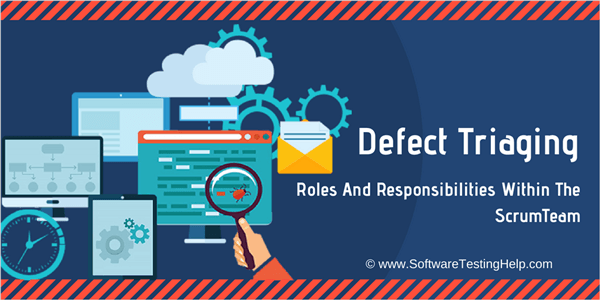 If the Defect is a valid one, then the team checks for the complexity of fixing the defect and the business impact it would make if left unresolved in the system. Everyone else in the team now analyzes and evaluates the bug for right classification and makes sure that the right Priority and Severity is assigned to the Defect. If the right Priorities and Severities are not assigned, then the team will reset them to the correct ones. Product Owner along with the team now will decide over which Defects to be fixed on priority and which can be assigned to the subsequent releases. During a defect triaging meeting, the defects are analyzed and evaluated by the entire Scrum Team. The Team then assigns the correct Severity and Priority to these Defects. Post the discussion and scrutiny, now comes the time when the Defect assignment is done. Under this activity, one or more Developers would be assigned to fix the Defect. Another Developer would be assigned to test the defect. Another very crucial activity is to examine the root cause analysis for each of the Defect and to come up with a process improvement plan in order to minimize the likelihood of having similar defect again in the system. All this is captured in a tracking system. For teams working under Agile, JIRA has been the favorite most. Therefore, at the end of the meeting, the team has a list of valid defects with correct Priorities and Severities assigned to them. The team also has a process improvement plan that should be adopted for the subsequent sprints. The Defect Triaging meeting is scheduled whenever a couple of Defects have been found and needs a discussion. Anyone who thinks that the Defect Triaging Meeting is required can raise a request for the meeting. In a common circumstance, the Defect Triaging meeting can help 2-3 times during a Sprint. But there is definitely no rule to it and the meeting can happen whenever the need arises. That is all we had in store regarding Defect Triaging Meeting. Defect Triaging Meeting is considered to be a step up activity to increase the agility amongst the Scrum Team Members. It has become an integral part of the Scrum process owing to the benefits it produces. In our upcoming tutorial, we are going to discuss the importance of Self Sufficient Scrum Teams. We will also lay emphasis on what Self Sufficiency means in the Scrum Setup and how a team can evolve to become a Self Sufficient Team.